. Published on September 20, 2015 . 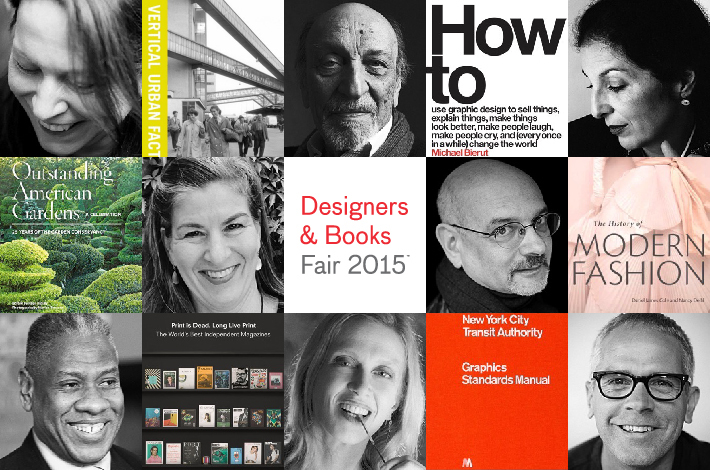 The very promising “Designers & Books Fair 2015™ “ has been scheduled for October (2nd-4th), in New York City at the Fashion Institute of Technology (FIT), a collaboration between Designers & Books and FIT. This continues to be the only book fair in the world focused on design at its broadest — architecture, experience design, fashion, graphic design, interior design, landscape architecture, product and industrial design, and urban design. A portion of the proceeds from the Fair will benefit the Gladys Marcus Library, which serves not only the immediate FIT community but also the larger design community in the New York City area and beyond. 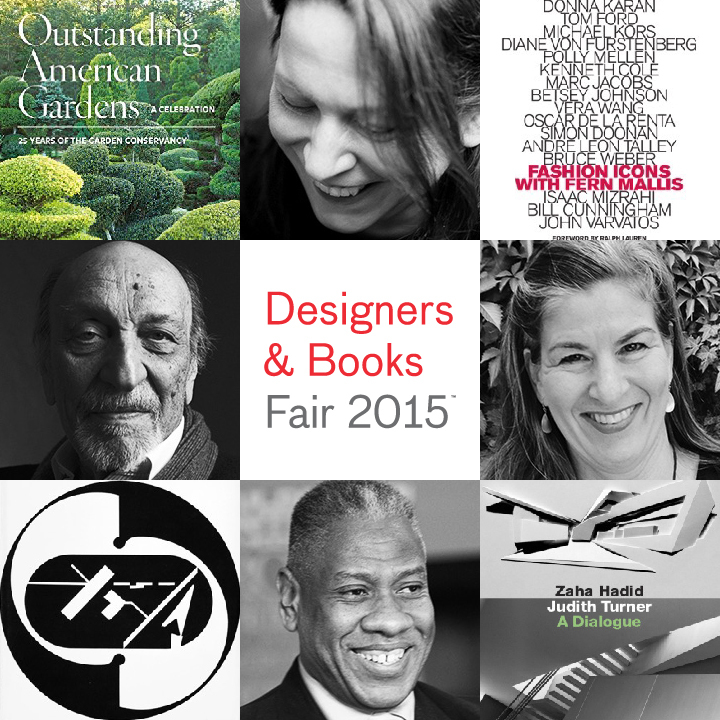 This year’s Fair will include more than 70 U.S. and European design book publishers and booksellers displaying and selling the newest titles for the fall and upcoming holiday season, as well as important backlist titles. There will also be notable rare and out-of-print book dealers and established and indie magazines. > 7 programs featuring noted design and art community members such as Milton Glaser, Steve Heller, Irma Boom, Daniel Libeskind, Peter Bohlin, and Philip Pearlstein. > Includes a completely new program—-“Experiences with Authors“—-which offers those who purchase books at the fair the chance to win special experience prizes with an array of design world luminaries such as Michael Bierut, Louise Fili, Chip Kidd, DJ Stout, Fern Mallis, Jesse Reed/Hamish Smyth, André Leon Talley, Gary Hustwit, Julie Iovine, Eames Demetrios, and many more. The complete list of Experience prizes is listed here. To enter this drawing, purchase Judge This at any time during the Fair. This author will sign books on Sat., Oct. 3, 1:00 p.m – 2:00 p.m. The winner of the Experience drawing for Graphique de la Rue will receive an invitation for two to join Louise Fili at her East 23rd Street studio in Manhattan for gelato and a tour. Also included for the winner: a box of Louise’s Perfetto Pencils. To enter this drawing, purchase Graphique de la Rue at any time during the Fair. This author will sign books on Sat., Oct. 3, 3:00 p.m – 4:00 p.m. The winner of the Experience drawing for Variations on a Rectangle: Thirty Years of Graphic Design from Texas Monthly to Pentagram will have the opportunity to join the book’s author, DJ Stout, on a New York City “mural crawl.” Stout, who is known for his advocacy of the art of illustration, will start the tour at the Society of Illustrators bar and then he and the winner will be whisked away in a limousine to five other Manhattan drinking establishments featuring important murals including the King Cole Bar at the St. Regis Hotel with its whimsical Maxfield Parish mural, the bar at the Carlyle Hotel featuring a mural by Ludwig Bemelman, the creator of the Madeline children’s book series, the Edward Sorel mural at the Monkey Bar depicting sixty Jazz Age icons and more. At each stop Stout will regale his lucky guest with the story of the mural and its creator–and he’ll buy them a cocktail or two along the way. To enter this drawing, purchase Variations on a Rectangle at any time during the Fair. This author will sign books on Sat., Oct. 3, 4:00 p.m – 5:00 p.m. The winner of the Experience drawing for How To . . . will receive an invitation from Michael Bierut to join him for lunch at his New York design firm, the renowned Pentagram, followed by a tour of his studio. To enter this drawing, purchase How to . . . at any time during the Fair. Michael Bierut will not be present at the Fair, but signed copies of his book will be available for purchase on Sat., Oct. 3, 5:00 p.m. – 6:00 p.m.and unsigned copies will be available during the entire Fair weekend. To enter this drawing, purchase Body Type 2: More Typographic Tattoos at any time during the Fair. This author will sign books on Sat., Oct. 3, 6:00 p.m – 7:00 p.m. The winner of the Experience drawing for the 1970 NYCTA Graphics Standards Manual full-size reissue will be able to meet Jesse Reed and Hamish Smith at Pentagram New York, where they are designers, located in the Flatiron neighborhood of Manhattan, take a tour of the studio, and have the opportunity to browse through the original 1970 Graphics Standards Manual designed by Unimark International. You’ll be able to take photographs, ask questions, and discuss the history of the original and reissued Manual. To enter this drawing, purchase The New York City Transit Authority Graphics Standards Manualfull-size reissue at any time during the Fair. Reed and Smyth will sign books on Sat., Oct. 3, 6:30 p.m – 7:30 p.m.